Sometimes after posting an entry, I decide or realise I should have added some more information. To that end, I have addenda for two recent posts. After putting together last week’s top tips for public speaking, I think I should slot an extra one after Think about your introduction. Avoid too much alcohol and/or a heavy meal before speaking. Both of these slow down the thought process. I recognise the meal often comes before the entertainment so try to leave sufficient time for it to digest. Being drunk at an organised event rarely makes a good impression on the audience, and is inexcusable if you’re paid to perform. I often have one coffee before I speak, which speeds up the thought process. A few entries ago, I also discussed how to set or avoid setting a story in a particular era. Yesterday, I finished the Anthony Burgess classic A Clockwork Orange, written in 1962 and set in a near-future society relative to that year. To avoid the problem of including dated slang, Burgess opts instead to invent his own jargon partly based on Russian. It’s easy to see why he chose that language, as the Cold War was at its height then. Many of the words have to be inferred through their context, as most editions deliberately omit a glossary. He does, however, also use English words in an uncommon manner. A couple of these words have made their way into modern slang and these passages read as though they’ve been written recently. A case in point is like, with which the main character Alex peppers his speech not only as a comparison but when he’s struggling to remember the words he means. There is another example, but I’m not sure whether it’s intentional, when he describes a stereo, “playing a very sick electronic guitar veshch,” the last word meaning thing or stuff. There is only one instance of it in this context, and it sounds as though it has the modern slang meaning that’s used alongside wicked and cool. For the rest of the book, Alex only uses the word sick when he’s feeling physically ill, and the Wikipedia appendix doesn’t list it. Finally, yesterday marked the birthdays of three very famous writers. Robert Burns is the most obvious – I read To a Mouse to an audience in honour – but Virginia Woolf also burned candles on 25 January, and one of my major influences John Cooper Clarke turned 66. Thanks to electronic publishing and print-on-demand, there are more ways than ever to read fiction. It is, however, as important as it’s ever been for a writer to be able to stand in front of a crowd and read out his or her pieces. A good live performance means engagement with your existing audience, a chance to have your name known by more people, and – if you’re published – to shift more copies of your work. I was performing on Thursday just gone, and I’m scheduled to take part in three more over the next fortnight. To that end, I’ve put together some advice for speaking to an audience. These should be treated not as unbreakable rules, but as guiding principles to bring out a better performance. Explain if you need to, but don’t apologise. A good example is when you’re reading an unfinished piece of work. In December, I read out an unedited piece I’d written during National Novel Writing Month. I felt I needed to explain that what they were about to hear wasn’t as highly polished as they were accustomed to, but I was still willing to share with them as an example of what can be done in a month. Should you feel the need to apologise, it’s worth reconsidering whether you want to read out that particular piece. Before reading to someone, read to no-one. Find a space where you’re on your own and hear how it sounds. Check the inflections you use in the piece, and whether there are any long sentences where you need to take an extra breath in the middle. If you’re reading a new piece, this is also a prime opportunity to make edits. Practice your page turns. Unlike a rock star, the great thing about being a writer is that you’re often allowed to take your notes on stage. When reading from a book or from sheets of paper, turn up the corner slightly or stick a post-it note on each page to help turn them more easily. When using an e-reader or tablet computer, make sure you practice tapping the correct area of the screen to turn the page, as there is a delay on some devices. Keep your mouth where everyone can hear it. Avoid tilting your head down to read the piece; instead, hold your manuscript higher and off to one side so it doesn’t muffle your words. Always speak loudly and more slowly than you would in normal conversation. If a microphone is available, keep it at the same distance from your mouth; I’ve seen too many readers wander around the stage and it sounds like a Norman Collier routine. Where possible, work with the sound engineer to set the level before the gig begins. Sometimes the audience reacts in the wrong places. I’ve had experiences where an audience didn’t laugh in a place I’d expected; don’t point out it’s a joke or tell it again, just move on to the next part without comment. There might be occasions where they react, positively or negatively, in an unexpected place; in this case, pause until it dies down and move on without comment. Signal that you’ve finished. Just lower your manuscript by your side and/or say, “Thank you.” The audience will take the hint and applaud. Do it again. This guide doesn’t cover how to deal with nerves. There are many tricks you can use to overcome them: the classic advice to imagine everyone naked, or more unusual methods such as looking at people’s eyebrows to avoid eye contact. However, the only effective way of becoming a confident public speaker is by doing it again and again. It’s worth remembering that the audience sometimes is nervous on behalf of the speaker and most will be forgiving even if you make a mistake. I’m pleased to report that I’ve been asked to respond to the Jim Campbell exhibition currently showing at Dundee Contemporary Arts. Until now, only other artists had been invited to do this, but there will also be poets and prose writers this time. 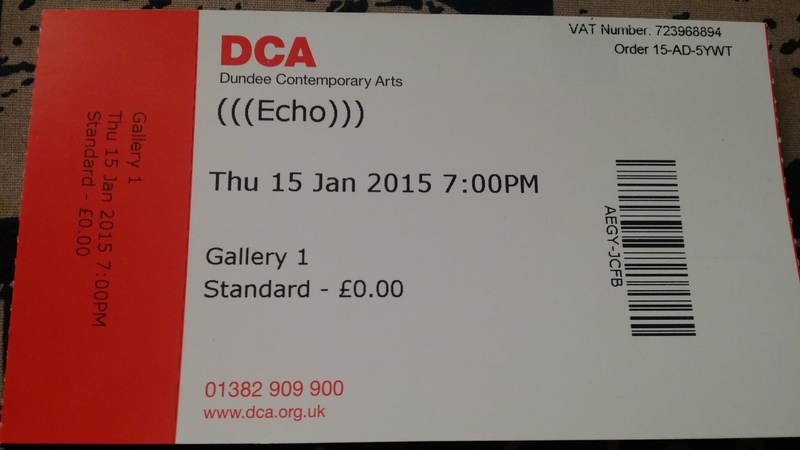 The event takes place on Thursday the 15th, 7pm, Gallery 1; tickets are free of charge. Something that fascinates me about the creative arts is the ability for writers and artists to respond to each other through their work, often very quickly. A recent example is how cartoonists around the world reacted to the Charlie Hebdo shootings. I’ve previously taken inspiration from the Michael Brown riots in November. In the BBC News report, there was a snippet of a police officer shouting, “Stop trying to turn over the vehicle immediately,” through a megaphone. I responded with a 340-word piece, but only to that fragment of speech, not to the rest of the events in Ferguson. But it doesn’t always take tragedy to provoke a response. In 2000, Tony Blair lifted his arm at the end of a speech and inadvertently revealed a sweaty armpit. A day or two later, a deodorant company used the image in a press advert. This isn’t the first time I’ve responded to an art exhibition, although I wasn’t asked to do so last time – I was simply inspired. A friend’s solo show opened on a Friday in summer 2013. By the time I caught the bus home, I was beginning to develop the idea. I spent the weekend typing it up and changing the names to ensure it was definitely fictionalised, and I sent it to her on the Monday. On Thursday, it’ll be a different type of response. I’ve spent weeks working on it and had time to explore different options such as using props. All I need to do now is keep rehearsing so the response is as fluent as I can make it. Next week, I’ll be offering click save draft my best tips about public speaking. Not all of these were traditional novels. Numbers 5, 6 and 7 were poetry chapbooks, 9 was a collection of essays, while 14 is my first foray into reading graphic novels. My favourite of these had to be number 1. It was published in 1880 and was ahead of its time both in terms of the technology used in the story and that the main characters are all women, with the men in supporting roles. My least favourite was number 10. This choice will rub up two of my lecturers the wrong way, but while the quality of her writing is high, her books never form much of a story. I had to wait until page 168 for anything major to happen. Since I became a writer, I’ve tried to finish any book I’ve started even if I find it hard going. I’m currently trying to plough through the abstract concepts in Mein Kampf by Adolf Hitler, and I tackled Crawling Round South Oakwood by Stephen Slaughter a couple of years ago although it read like an unedited first draft. Before then, I would give up after a short time; I didn’t make it past the first few pages of Road to Mars by Eric Idle, nor A Brief History of Time by Stephen Hawking. Mathematician Jordan Ellenberg has developed a formula based on the latter of these books called the Hawking Index to estimate how far people are reading before giving up. It uses the five passages in each book most highlighted by Kindle users. However, in the time since the publication of the formula, the title of least-read book is no longer Hawking’s masterpiece, but Capital in the Twenty-First Century by Thomas Piketty. You can read the full list here.